Earlier this week, I made my Green Garlic and Maple Soy Salmon, an old favorite in our house and I carried some of the flavors into this well seasoned and nuanced Kabocha Squash. The smooth and not too sweet temperament of the kabocha squash makes it perfect for spicy flavors. And, honestly just because it’s a squash or pumpkin does not mean we need to smother it with sweetness, it worked out pretty well in these savory pakoras, in fact, looks like they have developed quite a fan following. Anyhow, I cooked the soup low and slow on Friday, after the kids were in bed and on Saturday morning I felt like I had won the lottery, midst all the rushing around that is Saturday morning at right about 12:30pm, I was ready with bowls of this comforting and homey soup. 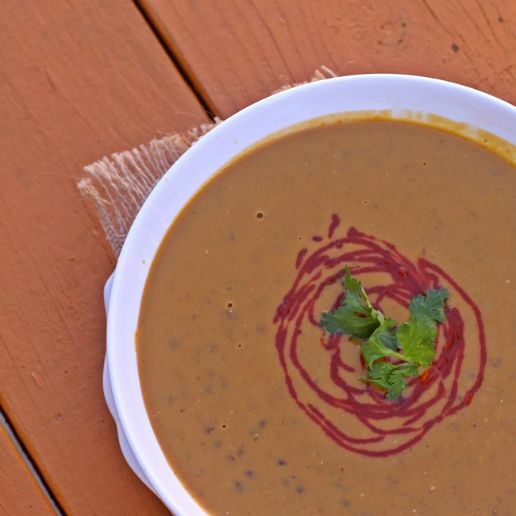 The soup has a smooth pureed base and then has lentils and rice simmered into the smooth base allowing the flavors to mellow and develop. This soup like most soups made from the scratch does take a little time, but in the scheme of things there is no straining or fuss involved. And, the soup will help you feel good and virtuous it is vegan and gluten-free after all. Honestly, with all the people and their myriad dietary restrictions recipes like this score high in my world, best part of everything was the kids loved it! 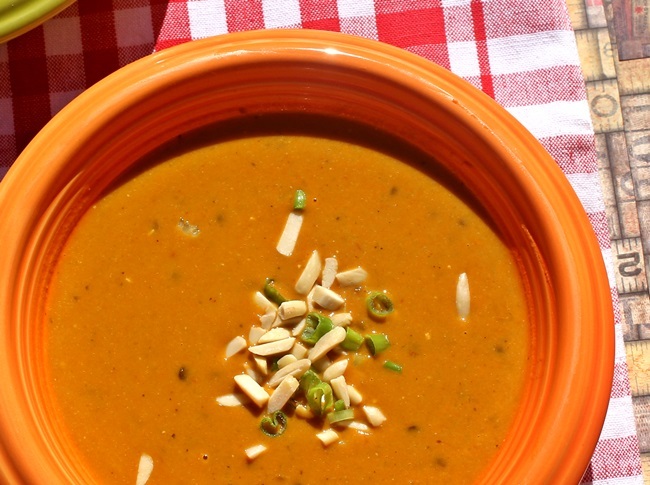 A deep sweet and spicy kabocha soup that is flavorful, healthy and very satisfying. Heat the oil and add in the onion and ginger and cook on low heat for about 10 minutes, the onions should be soft and sweaty. Add in the cinnamon stick (if using) and the diced kabocha squash and the tamari sauce and cook on low heat for 20 minutes until the squash is fairly soft. Add in 2 cups of water and bring to a simmer. Cool the mixture, remove the cinnamon stick, process to a smooth puree. Return to the cooking pot and add in the remaining water and salt to taste, and add in the maple syrup and cayenne pepper and mix well. When the mixture begins to simmer add in the lentils and brown rice and cover and let the mixture simmer for 1 hour, stirring occasionally once or twice. Stir in the coconut milk and let it cook another 10 minutes. It is important to cook the coconut milk on low heat. Sprinkle with fresh lime juice and serve garnished as you like.